Download application form for District Court Karak 2019 Jobs Via NTS from here. Last date to apply is Friday, 12th April 2019. District Karak is situated to the south of Kohat District and on the north side of Bannu and Lakki Marwat districts on the main Indus Highway between Peshawar and Karachi. It is 123 km away from the provincial capital Peshawar. It gained a district status in 1982, prior to which it was part of Kohat District. District Karak is blessed with mineral resources i.e. salt mines, oil, gas, and uranium have all been discovered here. Applications are invited from candidates having domicile of Karak to fulfill the posts in DC District Court Karak. All those candidates who have the require qualification and are eligible for the District Court Karak 2019 Jobs Via NTS must apply to grab this golden opportunity. Applying procedure as well as other requirements for the jobs in Karak District Court are mention below. 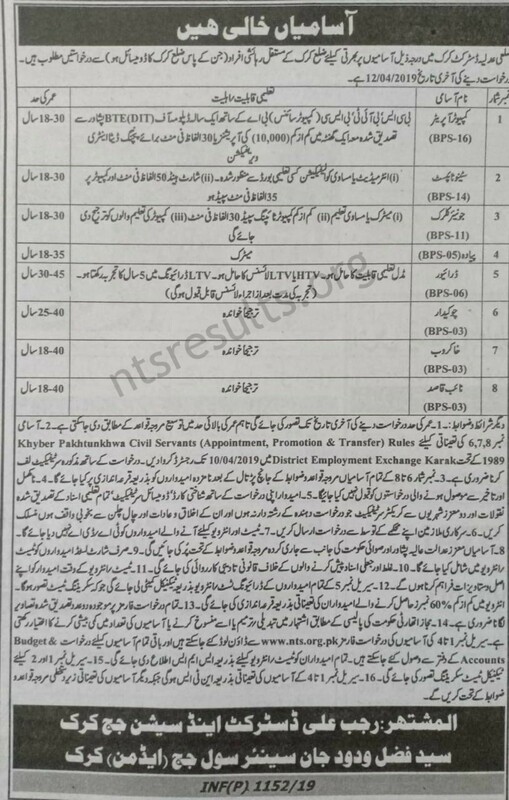 How to Apply For District Court Karak 2019 Jobs Via NTS ?